NOTE: (Go back one post to see the teaser video of Paragons Paragon if you haven’t seen it). These selected shots here were done by taking photos off my blog teaser video. 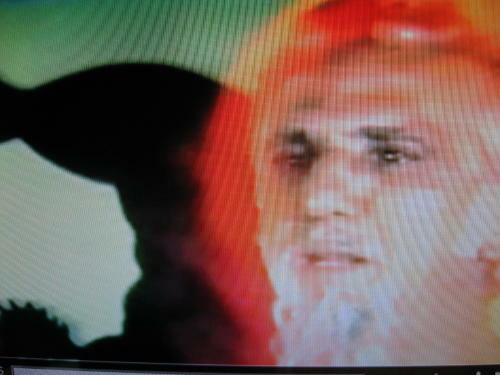 The chosen subjects here are in general not explained on the Making of Paragon video which is soon to be presented. Split screens are a form of double exposures. Split screens were used for the two Selleks in the elevator, and in Selleks quarters. One actor plays both parts but speaks to his counterpart who is actually not there. A matte box, is used to do the fx. 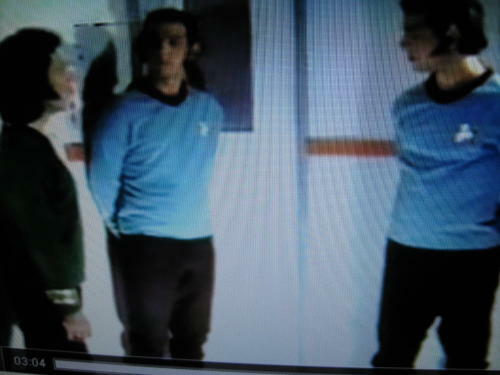 One half of the elevator with Kirk and Sellek talking is filmed, while the other half of the matte box has a black card in it. BLACK is nothing to movie film. It doesn’t block out anything and anything can be filmed over it. 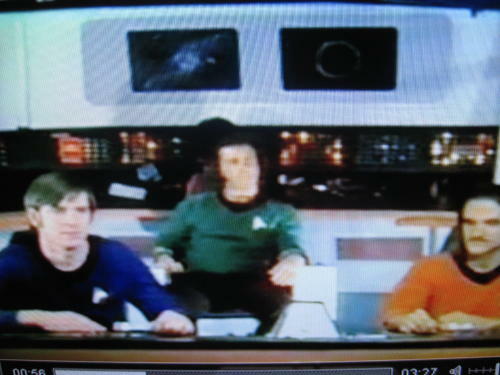 The camera sees the two actors (for example) on the left half and the right half is filming black. Next the film is wound back. The black card is put on the other side of the matte box. The actor now goes to the other side and talks to his counter part on the opposite side who really is not there now. He talks and responds to a tape recording of what was said. It is a fun thing to time out and do. The actors can not come near the dividing line where the two black halves meet. In my case it was the blue post next to the red bar. A rock steady claw pull down mechanism is needed on the cameras to make the fx succeed. It it jiggles the two sides would vibrate up and down. I used a Canon 814 super-8mm movie camera. The blinking lights were Christmas tree lights with blinker plugs. I collected all our relatives larger outdated lights. Thin foggy acetate behind cut out spaces in black cardboard finished the panels. It took two whole lines ; all of downstairs and part of up stairs to turn on the panel lights and also the quartz movie lights to do the filming. I used KA 40 whenever I could because it was less grainy and had better colors than the faster speed Ekchromes. The KA 40 needed lots of lights to get a good f stop on the camera. If the television upstairs was turned on during filming it would blow the fuses. For this strange bridge scene I filmed it with B&W movie film, pulled it out of the cartridge, and then took it into my darkroom and processed it as a negative. Photography used to be a hobby of mine. I took the negative film and projected it through my Aerial Image Optical Printer and re-photographed it with a red filter. The re-filming is done one frame at a time. I built my own Aerial Image Optical Printer so I could try out some unusual fx. This type of printer is what Disney used when he combined cartoon figures with live action actors. The Aerial image is an “image suspended in space”. Sounds cool doesn’t it . Perfect for sci-fi movies! 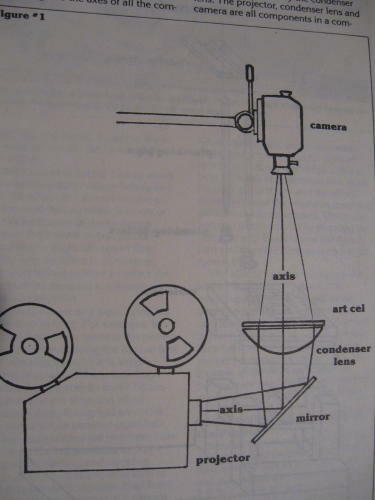 Anyhow it uses a projector, a big lens (mine was a big round magnifying glass), a beam splitter mirror, a camera, and a plate that sits on the face of the lens. A beam splitter mirror is a mirror that allows a percentage of light to pass through it rather than reflecting all of it off.The plate is where fx and mattes and animation figures can be applied and lighted. Both camera and projector must have pin registration or a rock steady claw pull down. 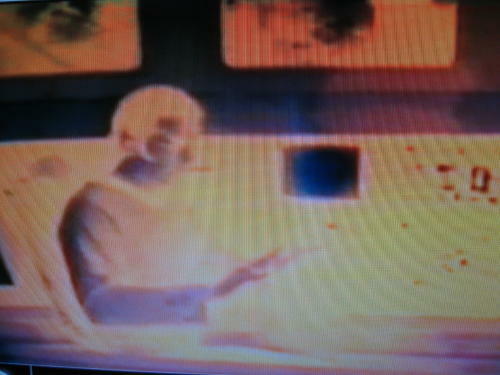 The aura was created using the optical printer. I filmed Ayelbourne , who in real life was my Uncle Tony. Then re-copied him in the printer as I frame by frame moved a special Vaseline gel with a matte over the plate and around his face and body. (see the Making Of Paragon when I drop it in the blog). My dad and uncles are typical kind, but macho Italians. It took some finagling to get them to agree to be in my what they might have called it “silly little outer space movie”. They were Earth people not Oraganians. I started with my dad and he said “I don’t think so John” I said what if Uncle Chris and Uncle Tony do it. He said “Ok if they agree to do it”. I don’t think he thought they would agree. I asked my uncle Chris next. He said “No thank you”. I said but my dad said he would do it. He said “ok”. Uncle Tony would be tough. He said “no” I said ” But Uncle Chris and my dad are going to do it. He said”Well if they are going to do it I guess I could. I think you get the idea. I was a fun task to tackle; getting them in the movie. We had to make big Q cards for my uncle to read when he did his part. I have a great family! The cavern was a 4 by 8 foot Lunar landscape (seen in previous post) re shaped into a 2foot tall, 4 x8 foot cavern. 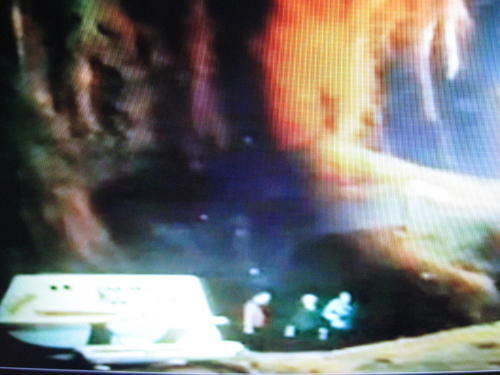 A 35 mm slide was taken of the cavern. Actors were filmed in a field at night. Using simple BACK PROJECTION onto foggy acetate the actors were projected into a dark area of the slides projection on the acetate. This is very much like the technique used in the old B&W King Kong 1933 movie. The old black and white King Kong is one of my top ten favorite movies. The colored lights floating around in the cavern was done using another projector with mattes and Luma fx. Luma was a term Edmund Scientific Co. used for exciting lighting effects. It was used as a Disco effect. Remember this was done at a time not to far from psychidelic Hippie days when dance places would have weird lighting designs floating across their walls to match the weird designs floating around in a lot of peoples minds. Its primary component is an aluminum foil type material which is crinkled up and put on a rotating wheel. Then a spot light (in my case a projector light) was beamed through another rotating multi-colored rotating wheel and onto the Luma wheel and then it bounced onto a foggy acetate back projection screen. I filmed it. This film was processed and I used the Aerial Image printer to combine it with a slide or movie of the ship. It depended on what I wanted. Or I could matte out the ship to keep the lighting behind it. 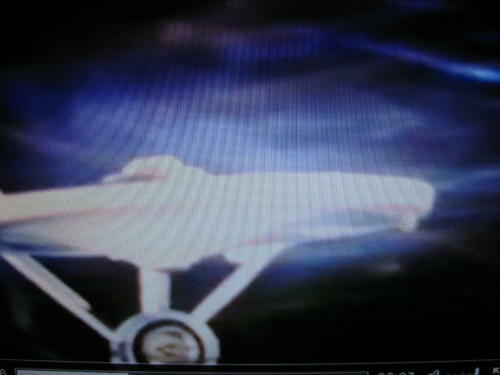 Or I could do the lighting fx film back projected and then double exposed over the model of the ship. Lots of ways to do it depending on the way I wanted it to look. Carrik welding was very simple. 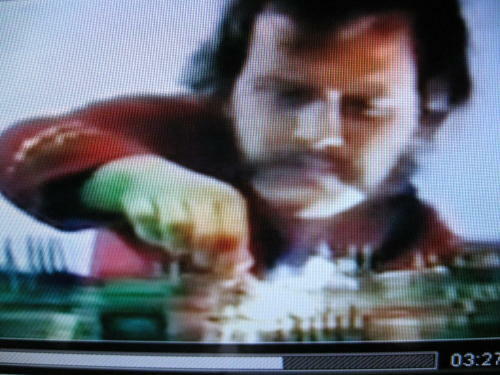 A 4th of July sparkler was moved under the electronics board and the actor on top matched his moves to the sparklers. The electrons panel in the Shuttlecraft was long rolls of actual computer control tape used to tell machinery how to perform various operations. Tape with holes scattered about. That is the modern era that Paragon was conceived and made in. Pretty antiquated aeh? 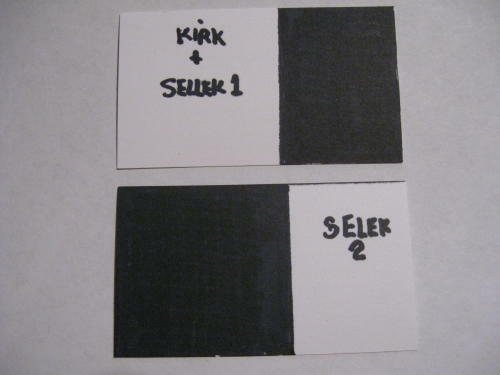 Anyhow A black cardboard with slots to fit the tape and machined to unroll the tape past Sellek as he speed them up. Our motors were three people pulling the tapes across the black panel and then rolling them back up by hand for each re-take. 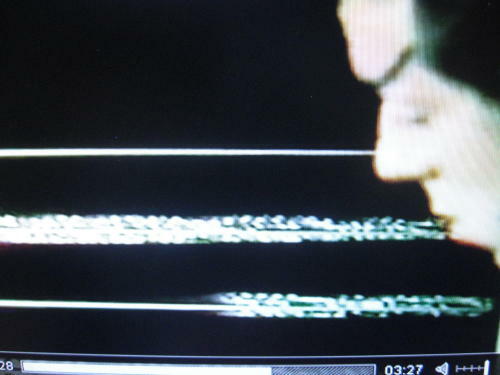 There was a lot of impatience with flubbed lines by the people who were working the tapes. The actors wanted to get home. We did a lot of filming after people finished their real jobs. The schedule was pretty precise. We filmed every other day. I had to wait for film to be processed. And I needed time to set up the different scenes scheduled for every other day. It was complicated. People had their own lives to live , but they really did a good job of working things out. The weather was horrible. Lots of snow storms 8 inches deep. Some it the snow is seen on the bloopers and I changed a scene in the movie into one with snow because it snowed! The back wall had string glued to it and then Aluminum foil glued over it. 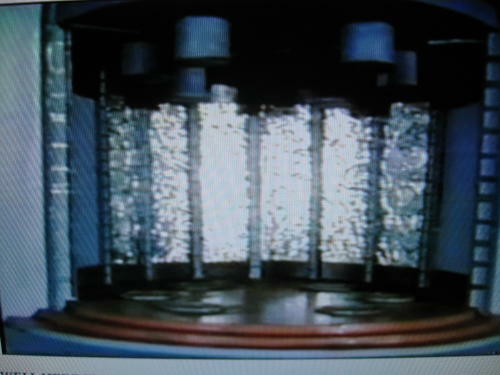 The top light pods that flashed on and off were the cardboard tubes that come inside of toilet paper rolls. The twinkles and the actual making the thing work is shown on the making of Paragon video. And once again the Aerial image printer and mattes were used. The miniature of the front of the bridge was filmed with the blinking tracking light. 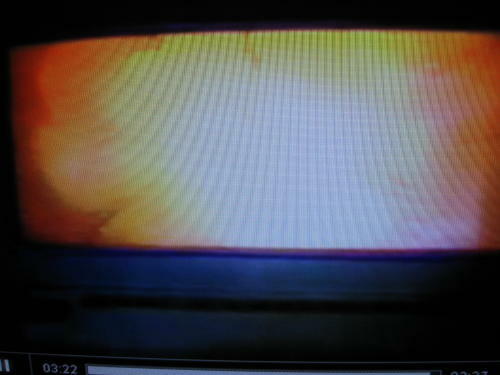 The second piece of film would be the explosion or explosions. 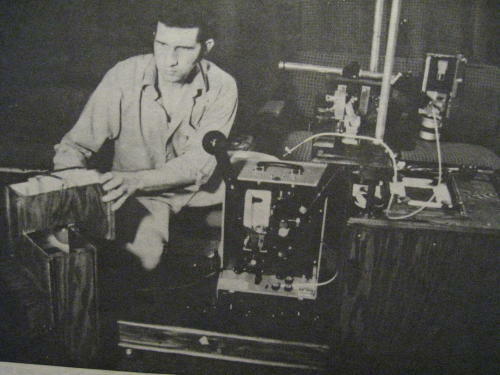 The two pieces would be combined in the Optical Printer. Oh yeh, How did I do the actual explosions? It was so simple and turned out so good that I am saving it for you to see on the “Making Of Paragons Paragon”.